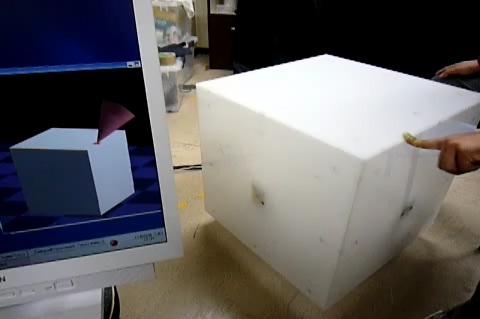 Our laboratory is developing a simple tactile sensing mechanism for a robot[1,2]. The mechanism is composed of external force sensor device and an end-effector of shell-shape. Since the end-effector plays the role of an outer shell, a force can be sensed at any position on the body, in other words, whole-body force sensation is realized. It is possible to calculate the position of a contact point without any sensor array. Therefore, the costs and wirings are reduced. Another advantage is that the six-axis resultant force is measurable. The technique has been applied to a technique for intuitive command recognition named ¡Èhaptic gesture¡É . Invisible feature of haptic information is also applied for biometrics. The issue of fault in force sensors is overcome by introducing a redundant sensors and with signal processing for fault compensation. It was an issue that there is a limitation on the shape of the end-effector to be a convex hull, while we have recently developed a technique to eliminate the limitation. T. Tsuji, Y. Kaneko, S. Abe: ¡ÈWhole-Body Force Sensation by Robot with Outer Shell,¡É Proc. 10th IEEE Int. Workshop on Advanced Motion Control (AMC'08), pp. 365-370, March, 2008. T. Tsuji, Y. Kaneko, S. Abe: "Whole-body Force Sensation by Force Sensor with Shell-shaped End-effector, " IEEE Trans. on Industrial Electronics Vol. 56, No. 5, pp.1375-1382, 2009. T. Tsuji, T. Ito: ¡ÈCommand Recognition by Haptic Interface on Human Support Robot,¡É Proc. of the IEEE/RSJ International Conference on Intelligent Robots and Systems (IROS'2009), pp.3178-3183, October, 2009. T. Tsuji: ¡ÈRealtime Personal Identification Based on Haptic Information,¡É 2011 IEEE International Conference on Robotics and Automation (ICRA2011), pp. 1354-1359, 2011. T. Tsuji. R. Hanyu: ¡ÈFault Tolerance Measurement Using a Six-Axis Force/Torque Sensing System with Redundancy.¡É Proc. Of the IEEE/RSJ International Conference on Intelligent Robots and Systems (IROS¡Ç2010), pp.1890-1895, 2010. N. Kurita, S. Sakaino, T. Tsuji: ¡ÈWhole-Body Force Sensation by Force Sensor with End-Effector of Arbitary Shape,¡É Proc. of the IEEE/RSJ International Conference on Intelligent Robots and Systems (IROS¡Ç2012), 2012. "Haptic Desk" is a desk-type tactile interface. The external force and the contact point on the desk can be calculated by attaching force sensors on the legs. Virtual switches are set on the surface and used to operate applications. Currently, Power Point can be operated by using these switches. Moreover, the object can be recognized using its weight registered in advance. In the left figure, the PC is recognized and the external force and the contact point are displayed. Using this technology, an existing product, such as consumer electronics or furniture, can be converted into a tactile interface. The rehabilitation robot developed in our lab is shown in the left photo. The motor control function of the upper limb is trained through the kinetic therapy realized by the robot arm actuated with pneumatic muscles. 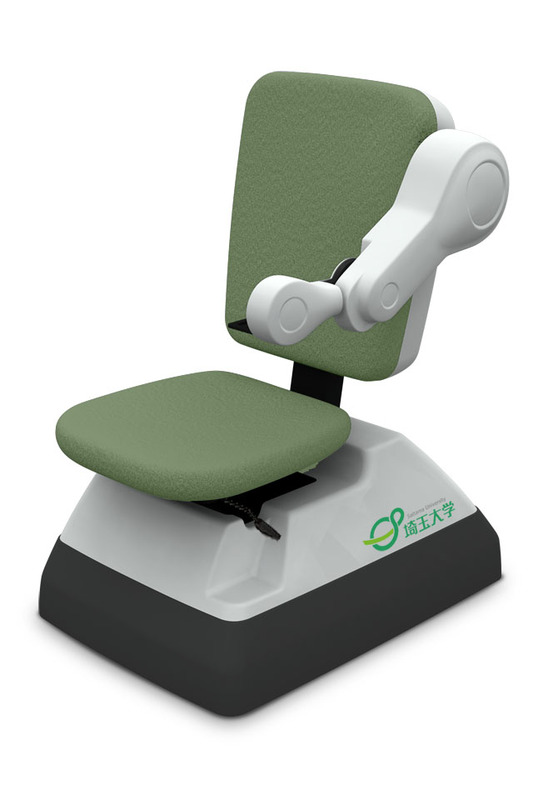 The rehabilitation robot is introduced in detail in the project website.